The rotator cuff is a sheet of four tendons that covers the top, front and back of the top of the arm bone at the shoulder (the humeral head). These tendons hold the ball of humerus into the socket of the shoulder. Tears in the rotator cuff cause pain and weakness in the shoulder. Dislocations occur when the ball of the joint comes completely out of the socket. Subluxation occurs when the ball comes part way out of the socket. Once a dislocation has occurred, it may occur again, especially in younger people. Both problems cause pain and decreased range of motion of the shoulder. These problems are called shoulder instabilities. Frozen shoulder occurs when an inflammatory process causes severe pain and stiffness in the joint. Impingement of the acromion, the bony top of the shoulder, or lesions on the head of the humerus, or upper arm bone, can also cause pain in the shoulder. Treatment of these problems are discussed in the other shoulder surgery section. The labrum is a border of cartilage that surrounds the shoulder joint and forms the base of the biceps tendon. The labrum can become partially detached from the tip of the shoulder. This is called a SLAP lesion. SLAP lesions are very hard to diagnose. They produce pain with activity and often occur after minor trauma. 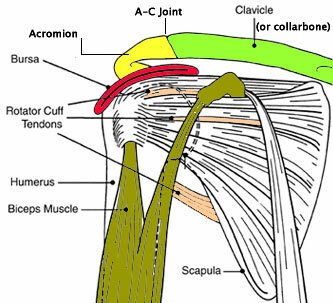 The A-C or acromioclavicular joint is the point where the clavicle (or collarbone) meets the acromion. This joint at the top of the shoulder often becomes arthritic and painful. Or it can be damaged by a fall or overuse. Sometimes, this pain can be resolved with an injection of steroids. If it persists, it can be treated with a surgery called distal clavicectomy.